10 x € 120.00 / mėn. ? The reliable performer for onsite photo operations! 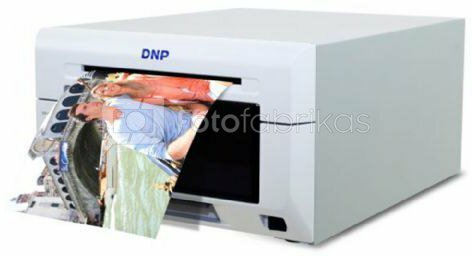 The DNP DS620 Digital Dye Sublimation Photo Printer is ideal for printing large quantities of professional quality photos in a timely and cost effective manner. The DS620 has the ability to print a high quality, 10 x 15cm print in just 8 seconds and provides you with the option to finish your prints with either a glossy or matte coating. This setting can be changed on the printer without having to switch the paper. The print head is located in the back of the printer to minimize its vulnerability to damage. The DS620 produces exceptionally detailed prints, which are not at all compromised by its outstanding speed. A strong laminate covering coats the prints to protect them against damage caused by water, dust, UV and fingerprints. The printer is equipped with a ‘ribbon rewind’ function, optimizing the unused portion of the paper and as a result, lowering the consumption of the ink ribbon. For example, it is possible to print 1 separate 10 x 15cm print out of one 15 x 20cm ribbon. Once the first 10 x 15cm print has been printed, the ribbon can rewind a maximum of one length of the ribbon, to print another 10 x15cm. Due to the ‘Ribbon Rewind’ function, the 10 x 15cm printing paper has been discontinued. The 13 x 18cm and 15 x 20cm remain, making the DNP DS620 economically friendly in regards to paper. The DS620 can produce up to 400 prints per hour. This makes it one of the fastest professional photo printers in the world. Using the advanced printer driver, it is possible to check the printer status, remaining prints on the ribbon, total number of prints produced by the printer and the firmware version. The quality of the prints is improved significantly, through the increased quality of the laminate coating over the top of the prints and the supple coating used on the ribbon. Both improvements allow the thermal print head to last longer. The ultra-low power standby mode uses less than 0.5W of power, lowering costs and expanding profitability for its users. DNP has developed a free software package called ‘Hot Folder Print’ (HFP) available to their customers. The idea is simple, select a folder in which the pictures will be placed and you can select the printer and layout. After this you can simply start taking pictures and the pictures will be printed automatically from the selected folder. The Hot Folder Print software is currently only available for Windows. The DNP DS620 printer uses 15 x 20 paper to Print 5 x 15 , 10 x 15 prints. * The DS620 has a warranty period of 2 years or 100,000 prints. The various photo paper sizes are always in stock and available for immediate delivery. Please see the optional accessories tab below to view the various paper options.